Author Allen Northcutt's fun-filled holiday tale weaves a whimsical 'ugly duckling' story of animal friends that love an amiable but tattered moose whose name is 'Ugly'. This picture book introduces eleven animal characters in rhyme as they join Ugly on a snowy trip through the woods to Momma and Poppa Bears' house. There, a Christmas eve party is made very special when Ugly gives unselfishly of himself to overcome a forgotten Christmas tree. The story addresses everyday issues of how 'Ugly' names are hurtful and it is not nice to exclude someone from a group because they are different. In the end the animals embrace Ugly as part of their group and change his name to Chris Moose, because it sounds so much like Christmas and is what his spirit is all about. Christie Morris' captivating and humorous illustrations add magic to this soon-to-be-classic Christmas story. Allen Northcutt, wrote the first draft of 'Chris Moose on Christmas eve in 1982 while dealing with the many issues of raising a learning disabled child. And then the manuscript sat in a drawer for 29 years. Allen is a decorated U. S. Marine Corps fighter pilot, Vietnam war veteran and retired investment banker. His enduring passions are the outdoors, adventure recreation, competitive sports, and spending quality time with family and old friends. 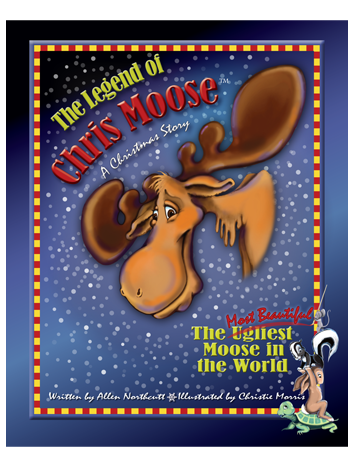 Motivation to resurrect Chris Moose came from friends encouragement that Chris Moose could become the first new perennial Christmas character in the past 50 years. OLD STONE PRESS is a privately owned author services imprint of J.H. Clark & Associates, Inc. in Louisville, Kentucky. As a marketing partner for FastPencil-WaveCrest, Old Stone Press specializes in coordinating the FastPencil-WaveCrest custom book marketing packages and services for those authors who do not want to be involved in the daily detail and nitty gritty of book production, marketing, and sales/distribution of their books.